This week’s top stories from Young Farming Champions across the country ( and the globe). No farm nearby? No worries! Cotton Young Farming Champion Emma Ayliffe has taken her paddocks to Parramatta, skyping with students participating in The Archibull Prize. Parramatta Public School teacher Esra Smerdon feels that Emma’s presentation from the paddock – covering all things from moisture probes to weeds – helped to give the students a different perspective. Parramatta Public School have wrapped up their skype sessions with Emma and are sharing the journey of their Archie aptly named ‘Moona Lisa’ on their blog – check it out here. As the first official week of spring rolls around again, canola producers in drought-affected regions of Australia are having to make tough decisions about their crops. Grains Young Farming Champion Marlee Langfield spoke to 9 News Central West about how her canola crops look to be hanging on following some timely rainfall near Cowra, NSW. For those farmers who are deciding whether to salvage their canola crops for fodder, grain or grazing, resources to aid decision making can be found at NSW DPI’s Drought Hub. All roads certainly lead to Narromine the first weekend in September for the annual agricultural show! Grains Young Farming Champion and 2018 Narromine Showgirl Keiley O’Brien had a busy weekend of Showgirl duties, including everything from judging the junior quest to the scarecrow competition. Keiley will be a guest host on the Picture You in Agriculture Facebook page this week, taking us behind the scenes of the show and her role as Showgirl. Head over to the feed to catch up on all that she’s been up to! From shows in NSW over to SA, the Royal Adelaide Show kicked off on 31st August and runs until 9th September. 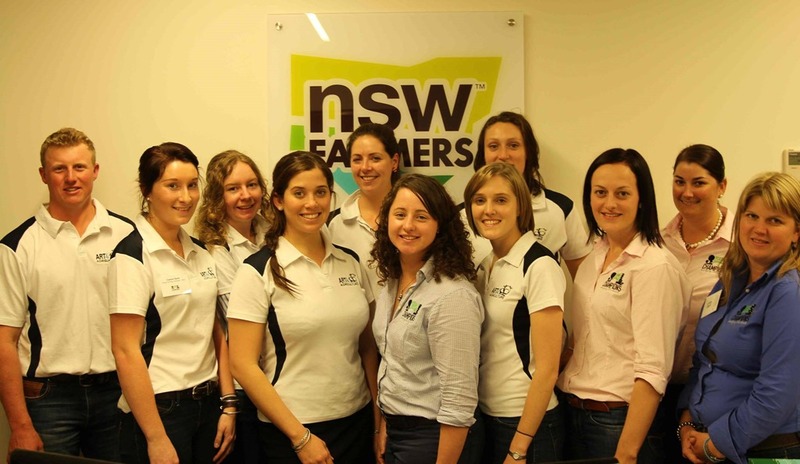 Young Farming Champions Meg Rice and Erika Heffer are also 2018 Royal Agricultural Society (RAS) of NSW Rural Achievers and are visiting Adelaide show as part of an exchange program with RAS NSW and Agricultural Societies Council (ASC) of NSW. We look forward to following their experiences at Adelaide! 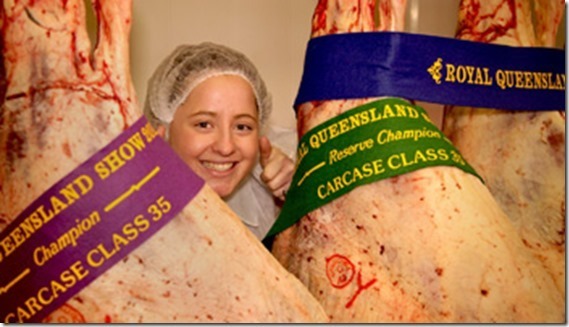 Erika Heffer, Young Farming Champion and RAS Rural Achiever, tweets from her visit to the Royal Adelaide show. Young Farming Champion school visits as part of The Archibull Prize continue for 2018, with Cotton Young Farming Champion Laura Bennett visiting Miller Public School last week. Miller Public School’s team are well underway designing their cotton-themed Archie and received further inspiration during Laura’s visit. We are also excited to follow Wool Young Farming Champion Lucy Collingridge’s journey as she is heads to Barraba High School this week as part of The Archibull Prize. Wool Young Farming Champion and Inaugural WoolProducers Australia (WPA) Youth Ambassador Dione Howard commenced her WPA Ambassador role last week. Dione attended the Animal Health and Welfare Advisory Committee Meeting and Board Meeting in Canberra, learning much about strategy and policy over the two days. Wool YFC Dione Howard attended the WoolProducers Australia (WPA) Animal Health and Welfare Advisory Committee Meeting in Canberra last week as part of her WPA Youth Ambassador role. Grains Young Farming Champion Sam Coggins is in India for the next couple of weeks attending the Geography of Food Summer School. The Summer School brings together agricultural students from 12 countries to study millet supply chains and work towards restructuring these chains to achieve a sustainable food system. Sam’s Summer School experience in India will include presentations from invited speakers, discussions, workshops and excursions. Good luck to Wool YFCs Emma Turner and Bessie Thomas who are this week hosting health mental health social events in far-western NSW. The Ivanhoe Ladies High Tea will be held at the Ivanhoe CWA Hall this Friday, to coincide with Women’s Health Week, with information about health and wellbeing, make-up and essential oils. Emma and her team will be busy baking and prepping info packs this week ahead of Friday’s big day. Keep an eye on our Picture You In Agriculture Facebook page on Friday to see all the action. And at Burragan Station, Wilcannia, Bessie Thomas and her team of grounds people have been working round-the-clock on pitch preparations ahead of Saturday’s Barefoot Bowls and Bocce event. Bessie’s husband Shannan voiced concerns over the slightly undulating lay of the land and length of the grass, but Bessie says, “It’ll all add to the atmosphere and that’s the skill of the game – bowlers will have to adapt to the conditions.” Bessie says the “bowling brown” will be mowed on Friday and final pitch inspections will happen Saturday morning. Both Bessie and Emma will be posting live from their events on the Picture You In Agriculture facebook page so keep your eyes peeled. Mega congratulations are in order for Cotton YFC Emma Ayliffe who last week was announced as runner-up in the 2017/18 Adama Young Agronomist of the Year Awards. Emma will take part in an overseas study tour alongside Winner Kirsty Smith and Rising Star Michelle Egan as part of her award accolades. Cotton YFC Anika Molesworth has been announced as a finalist in the 2018 Green Globe Awards. This award recognises young sustainability champions who have developed practical solutions and helped communities to improve their environmental issues. Good luck for the final selection process Anika and congratulations on being named as a finalist! And to wrap up another huge week for the YFC team, we would like to congratulate cattle and sheep YFC Casey Dahl on her recent engagement! Dr Steph says the path of research is not an easy one to walk but it is paved with passion. Art4Agriculture has partnered with the dynamic Steph Coombes to contribute content to her phenomenal resource Ausagventures for all things YouthInAg and those thinking about venturing into the exciting world of a career in Agriculture. Each month along with 10 agricultural youth groups and organisations we will be writing a blog exclusively for Ausagventures. You can find their profiles below and scroll down to read their blogs and to see what #ausagventures they have been getting up to around the country and how you can join in here. In our first three blog we are going to feature our three Young Farming Champions who are currently daring to conduct very different and innovative research as part of their PhD thesis. The path of research is not an easy one to walk but it is paved with passion. My current research project is looking at objectively measuring meat quality. I am working towards being able to identify which lamb carcases will eat well and those that won’t. I am using a laser technology called the Raman spectroscopic hand held probe because it’s rapid, quantitative and non-destructive. Developing this technology for use commercially is a huge benefit to industry because you can measure the actual piece of meat that people are going to eat without destroying it and lamb producers can be paid for the quality of meat they are producing not just the weight. 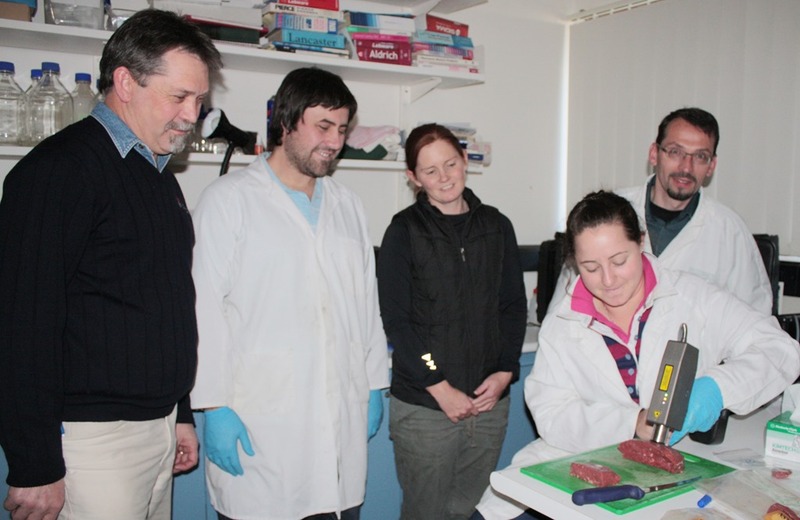 The fantastic team at DPI at Cowra (Matt Kerr, Tracy Lamb, David (my supervisor) and Heinar (the probe’s inventor). 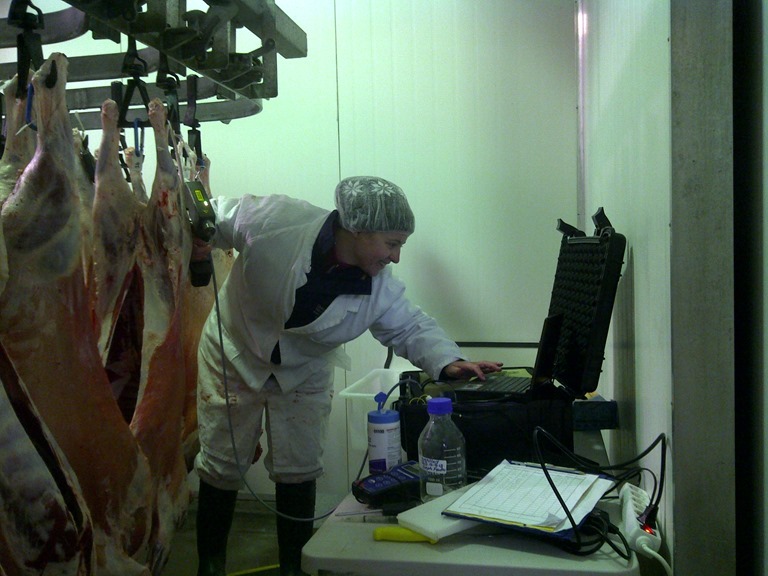 Over the last month I have been working on trials that take the prototype probe into lamb processing plants to figure out whether we can use it to determine how tender the meat will be early on in processing. While the work is exciting and new because there’s only two of these probes in the world (one here with me for a few months and another in Germany at the institute in Bayreuth where they are made), the work can be frustrating and deflating because every so often we come across a challenge we can’t see how to solve when we need to so we can continue working. Sometimes it’s something small like an electricity supply adapter that shorts out and then causes a bigger issue or an electric plug that’s lost a wire and sometimes it’s something a bit bigger like the equipment we need not liking the cold chillers. Because I work in smaller rural towns often these problems end in me driving somewhere to get a part or find someone who can help me. Makes for some long days when you start at 5am to be ready for the first carcases to come down to pack up, drive 2 hours, find the people or the part, and get in the car and drive back to be ready to start at 5am the next day. Add onto that some tough working conditions and you have yourself a somewhat difficult working week. It’s not all doom and gloom though, as Ken Jr. Keyes said “to be upset over what you don’t have is to waste what do you do have”. With a little love, help, and support from those I work with at the plant, at DPI, at uni and in my own team, the industry as a whole, and the towns and communities I work in as well as my friends and fellow PhD-ers near and far I have been able to salvage my trial and continue. Sometimes it’s been the technical help, sometimes it’s having the part in stock or knowing who does, sometimes it’s helping me make a decision or cooking a home cooked meal or offering me a bed but mostly it’s just being there, and listening and trying to understand. Research is a rollercoaster ride the ups and downs can come minutes apart and sometimes 20 seconds can change everything. Because each project is unique it can be isolating. 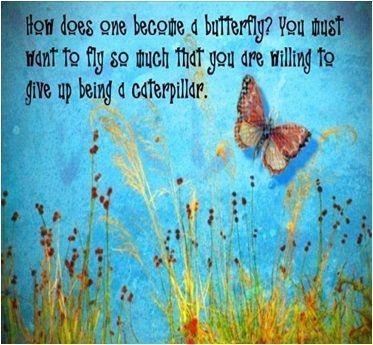 We each face issues and challenges that are also unique and that can feel isolating. Relationships with friends, family and significant others don’t always get off the PhD rollercoaster in the same condition that they got on either and that can feel isolating too. Combine that with the stresses of just getting ourselves through the ups and downs and that’s why I value and truly appreciate the phenomenal backing I have received over the last 2 years. I wouldn’t be still standing without it and without being reminded that it is always there. The backing of the industry and the communities I work in, the people I work with and those who believe in me and my work inspire my passion. They keep me striving at what I do to help move the industry forward. For that I am truly grateful. 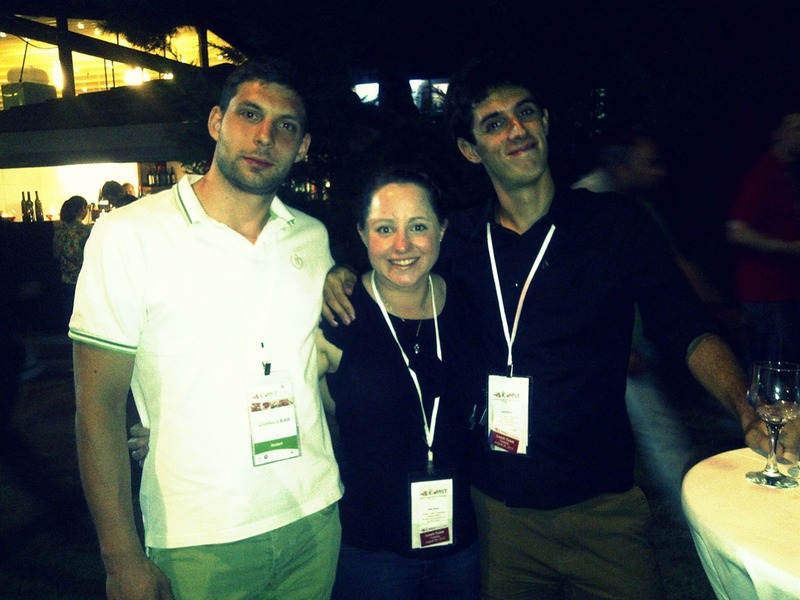 Me and my Italian friends Gianluca and Marco. Gianluca has become one of my biggest cheerleaders ever both professionally and personally. Author Picture You in AgriculturePosted on March 27, 2014 March 27, 2014 Categories Archibull Prize, Careers, cattle and sheep, Guest postTags ausagventures, Steph Fowler, YouthinAgLeave a comment on Dr Steph says the path of research is not an easy one to walk but it is paved with passion.